NEREUS was the old man of the sea, and the god of the sea's rich bounty of fish. He dwelt in the depths of the Aegean with his wife Doris and fifty Nereid daughters. 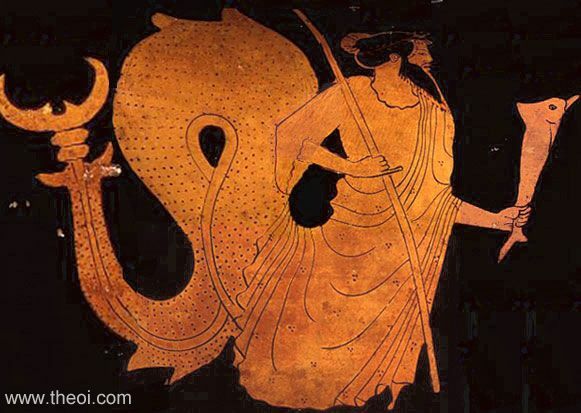 Like many of the other sea-gods Nereus was a master shapeshifter, and spoke with prophetic voice. It was for his knowledge that Herakles once wrestled him, in search of directions to the land of the Hesperides. 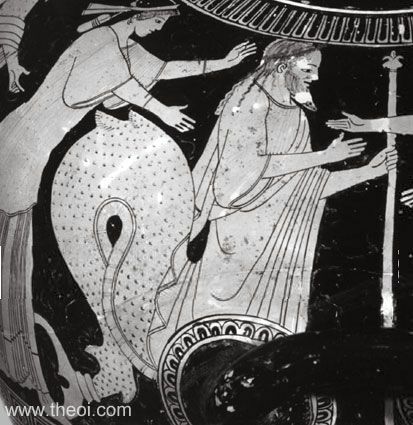 Nereus was depicted in ancient Greek vase painting as an old man with a wooden staff accompanied by a host of his Nereid daughters. Sometimes he had a coiling fish tail in place of legs (like the image right). 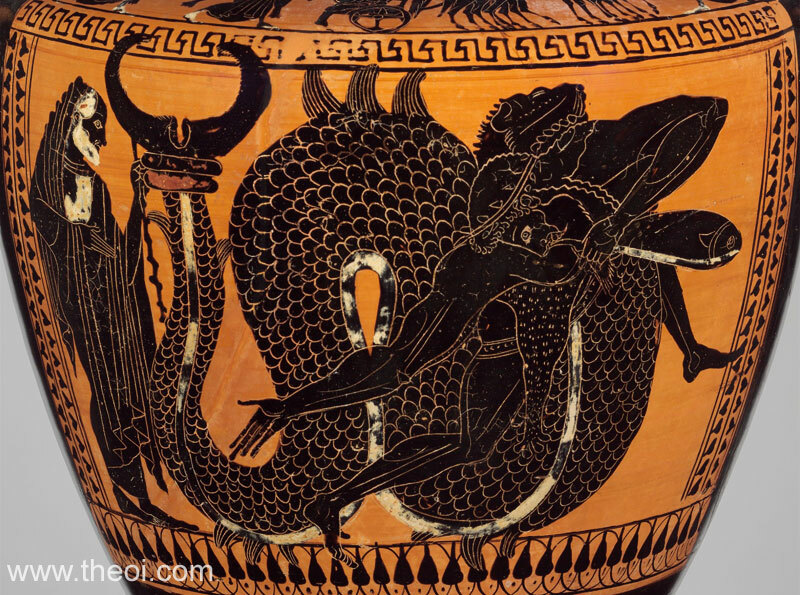 But unlike other similar gods, such as Triton and Akheloios, Nereus was almost always depicted clothed in a chiton. NEREUS (Nêreus), a son of Pontus and Gaea, and husband of Doris, by whom he became the father of the 50 Nereides. He is described as the wise and unerring old man of the sea, at the bottom of which he dwelt (Hom. Il. xviii. 141, Od. xxiv. 58; Hes. Theog. 233, &c.; Apollod. i. 2. § 6). His empire is the Mediterranean or more particularly the Aegean sea, whence he is sometimes called the Aegean (Apollon. Rhod. iv. 772 ; Stat. Theb. viii. 478). He was believed, like other marine divinities, to have the power of prophesying the future and of appearing to mortals in different shapes, and in the story of Heracles he acts a prominent part, justas Proteus in the story of Odysseus, and Glaucus in that of the Argonauts (Apollod. ii. 5. § 11; Horat. Carm. i. 15). Virgil (Aen. ii. 418) mentions the trident as his attribute, and the epithets given him by the poets refer to his old age, his kindliness, and his trustworthy knowledge of the future. In works of art, Nereus, like other sea-gods, is represented with pointed sea-weeds taking the place of hair in the eyebrows, the chin, and the breast. "He [Akhilleus (Achilles)] spoke in tears and the lady his mother [the sea-goddess Thetis] heard him as she sat in the depths of the sea at the side of her aged father [Nereus], and lightly she emerged like a mist from the grey water." "Thetis the silver-footed, he daughter of the sea's ancient (geron halios) [Nereus]." 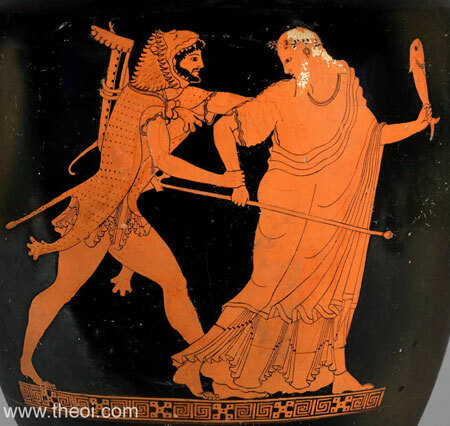 "He [Akhilleus (Achilles)] cried out terribly, aloud [over the death of Patroklos (Patroclus)], and the lady [Thetis] his mother heard him as she sat in the depths of the sea at the side of her aged father [Nereus], and she cried shrill in turn, and the goddeses gathered about her, all who along the depth of the sea were Nereides (daughters of Nereus). For Glauke (Glauce) was there, Kymodoke (Cymodoce) [and various others named] . . . and the rest who along thed epth of the sea were Nereides. The silvery cave was filled with these . . . and [Thetis] left the cave, and the others toegether went with her in tears, and about them the wave of the water was broken." "[Thetis] turning now to her sisters of the sea [the Nereides] she spoke to them : ‘Do you now go back into the wide fold of the water to visit the ancient of the sea (geron halios) [i.e. Nereus] and the house of our father, and tell him everything.’"
"Iris storm-footed sprang away with the message [from Zeus to the goddess Thetis in the sea], and at a point between Samos and Imbros of the high cliffs plunged in the dark water, and the sea crashed moaning about her. She plummeted to the sea floor . . . She found Thetis inside the hollow cave [of Nereus], and gathered about her sat the rest of the sea goddesses (theai haliai)." "But Pontos (Pontus, the Sea), the great sea, was father of truthful Nereus who tells no lies, eldest of his sons. They call him the Old Gentleman (Gerôn) because he is trustworthy, and gentle, and never forgetful of what is right, but the thoughts of his mind are mild and righteous. And yet again he got great Thaumas and proud Phorkys (Phorcys), being mated with Gaia (Gaea, the Earth), and fair-cheeked Keto (Ceto) and Eurybia." "To Nereus and rich-haired Doris, daughter of Okeanos (Oceanus), there were born in the barren sea daughters greatly beautiful even among goddesses . . . [fifty Nereides are named ending with] Nemertes, whose mind is like that of her immortal father. These were the daughters born to irreproachable Nereus, fifty in all, and the actions they know are beyond reproach, also." "Of the daughters of Nereus, the Old man of the Sea (halios geron), Psamathe (Sand-Goddess) the fair goddess, was loved by Aiakos (Aeacus) through golden Aphrodite and bare Phokos (Phocus, Seal). And the silver-shod goddess Thetis was subject to Peleus and brought forth lion-hearted Akhilleus (Achilles), the destroyer of men." "The rule which Nereus once proclaimed, the Old Man of the Sea (geron halios) : ‘Even to an enemy if he is acting nobly, we should offer full-hearted praise and that most justly.’"
"In Homer Proteus changed into all manner of shapes, just like . 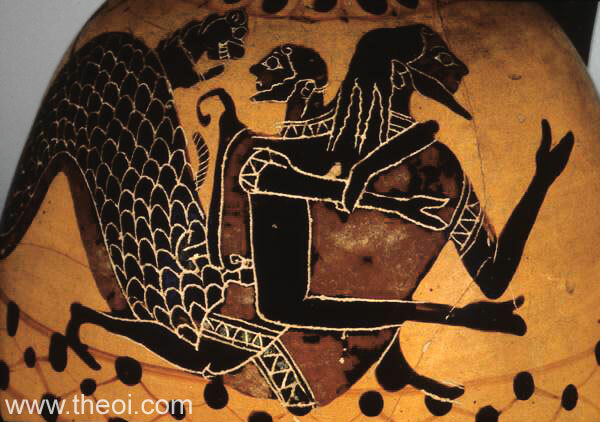 . . Nereus in Stesikhoros (Stesichorus), in Panyassis, Herakles (Heracles) got Helios' (the Sun's) cup from Nereus." "Carrying me [the poet Arion] on your [dophins] humped backs, cleaving the furrows of Nereus' plain, a path untrodden, when treacherous men had thrown me from the sea-sailing hollow ship into the sea-purple swell of the ocean." "Theonoe [daughter of the Nereis Psamathe], had divine knowledge of all things present and to come--a gift inherited from her grandfather Nereus." "The stormy whirlpools of Nereos (Nereus)." "The children of Pontos (Pontus, Sea) and Ge (Gaea, Earth) were Phorkos (Phorcus), Thaumas, Nereus, Eurybia, and Keto (Ceto)." "Nereus and Doris were parents of the Nereides, whose names were . . . [forty-five named]." "The Aigaion (Aegean) Sea where Nereus lives." "Glaukos (Glaucus), the sage spokesman of the sea-god Nereus." "They [the Argonauts] urged Iason (Jason) to kill the best of their sheep and hold it out to the god with words of praise. Iason hastily selected one, lifted it up, and killed it over the stern, praying in these words : ‘God of the sea [Triton], you that appeared to us on the shores of these waters, whether the Ladies of the Brine [the Nereides] know you as that sea-wonder Triton, or as Phorkys (Phorcys), or as Nereus, be gracious and grant us the happy return we desire.’"
"[Akhilleus (Achilles) addresses his opponent Memnon in a battle of the Trojan War :] ‘From supremest Zeus I trace my glorious birth; and from the strong Sea-god Nereos (Nereus), begetter of the Maids of the Sea (kourai einalia), the Nereides.’"
"[The funeral of Akhilleus (Achilles) at Troy :] Around them [the mourners] moaned far-stretching beaches of the sea, and mourned great Nereus for his daughter Thetis' sake; and mourned with him the other Sea-gods all for dead Akhilleus." "Him whom the people of Gytheatai [in Lakedaimon (Lacedaemon)] name Geronta (Old Man), saying that he lives in the sea, I found to be Nereus. They got this name originally from Homer, who says in a part of the Iliad where Thetis is speaking :--‘Into the broad expanse, and into the bosom of ocean plunge, to behold the old man of the sea and the home of your father.’"
"To Nereus, Fumigation from Myrrh. O thou sho dost the roots of sea (pontos ) keep in seats cerulian, Daimon of the deep, with fifty maidens [the Nereides] attending in thy train, fair virgin artists, glorying through the main: the dark foundation of the rolling sea, and earth's wide bounds belong, much-famed, to thee. Great Daimon, source of all, whose power can make the sacred basis of blest Deo [Demeter] shake, when blustering winds in secret caverns pent, by thee excited, struggle hard for vent. Come, blessed Nereus, listen to my prayer, and cease to shake the earth with wrath severe; send to thy mystics necessary wealth, with gentle peace, and ever tranquil health." "Hesiod sings of how Doris the daughter of Okeanos (Oceanus) bore fifty daughters to Nereus the sea-god, whom to this day we always hear of as truthful and unlying. Homer also mentions them in his poems. But they do not state that one son was born after all that number of daughters, though he is celebrated in mariners' tales. And they say that he was named Nerites and was the most beautiful of men and gods [a god transformed into a shellfish]." "Philoxenos (Philoxenus), the poet of Kythera (Cythera) [C5th-4th B.C. ], who was devoted to dainty food, was once dining with [the tyrant] Dionysios, and when he saw that a large mullet had been set before Dionysios, while a small one had been served to himself, he took it up in his hands and placed it to his ear. When Dionysios asked him why he did that, Philoxenos answered [in jest] that he was writing a poem on Galateia and desired to ask the mullet some questions about Nereus and his daughters [the Nereides]. And the creature, on being asked, had answered that she had been caught when too young, and therefore had not joined Nereus' company; but her sister, the one set before Dionysios, was older, and knew accurately all he wished to learn. So Dionysios, with a laugh, sent him the mullet that he had been served to himself." "Peleus, it is said, received on the occasion of his marriage [to Thetis] . . . from Nereus a basket of the salt called ‘divine’; and which has an irresistable virtue for the appetite, the taste of food and their digestion, whence the expression ‘she poured the divine salt.’"
"Thetis learned from her father Nereus the decree of the Moirai (Moirae, Fates) about her son--that one of two things had been allotted to him, either to live ingloriously or becoming glorious to die very soon." "[Invocation of Oppian as he begins his poem on fishing :] Thou, Nereus, and ye gods (daimones) of Amphitrite . . . grant me your grace!" "From Nereus and Doris [were born] fifty Nereids : [a list of these follows]." "[When Phaethon set the earth aflame riding the chariot of the sun :] Even Nereus, fathoms down, in his dark caves, with Doris and her daughters [Nereides], felt the fire." "Close to the sea [in Phthiotis] a temple stood, not bright with gold and marble, but a timber frame of beams and shaded by an ancient grove. The shrine belonged to Nereus and the Nereides, they are the Sea-gods (Di Ponti) there, a sailor said, spreading his nets to dry along the beach." "Stormy winds made the sea unassailable . . . Storming amid the Aoniae's main Nereus opposed war's [the Greek navy's] passage." "[Poseidon] he who rules Nereus and Nereides and the whole wide sea." "I [Galateia] whom sea-blue Doris bore, whose father's Nereus, who am safe besides among my school of sisters [the Nereides]." "[Briseis addresses Akhilleus (Achilles) :] ‘The most beauteous by far among the women of Achaea will come to the marriage-chamber as your bride . . . a bride worthy of her lord's father, the grandchild of Jove [Zeus] and Aegina, and one whom ancient Nereus would welcome as his grandson's bride.’"
"To him [the sea-god Proteus] we Nymphs do reverence, and aged Nereus himself; for the seer has knowledge of all things." "Thee [Dionysos], O boy, a Tyrrhenian band [of pirates] once captured and Nereus allayed the swollen sea; the dark blue waters he [Dionysos] changed to meadows." "The lofty Bears [constellations Ursae] shall know naught of caerulean Nereus [i.e. they never set into the ocean]." "Making path for the prows of ships, old Nereus [i.e. the sea] cleaves." "[Helene (Helen) speaks of the Trojan princess Polyxena's marriage to the ghost of Akhilleus (Achilles), son of the sea-goddess Thetis :] ‘Thee will great Tethys call her own, thee, all the goddesses of the deep [the Nereides], and Thetis, calm deity of the swelling sea; wedded to Pyrrhus . . . Nereus shall call thee daughter.’"
"The vessel [the Argo] stands high out of calm waters, and Thetis and her kinsman Nereus with his strong arms support it from the bottom of the sea." "[Akhilleus (Achilles) departing from the island of Skyros (Scyros)] does sacrifice to the gods and the waters and south winds, and venerates with a bull the cerulean king [Poseidon] below the waves and Nereus his grandsire: his mother [Thetis] is appeased with a garlanded heifer." "Triton heard the delusive lowing of Zeus [in the form of a bull, sailing across the sea abducting Europa], and bellowed an echoing note to Kronides (Cronides) [Zeus] with his conch by way of wedding song; Nereus pointed out to Doris the woman carried along, mingling wonder with fear as he saw the strange voyager and his horns." "Many a stray shot from the invulnerable thunderbolts of Zeus [in his battle against the monster Typhoeus] fell into the welcoming hand of Poseidon, unsparing of his earthpiercing trident's point; old Nereus brought the brine-soaked bolts to the ford of the Kronion (Cronion) Sea, and dedicated them as an offering to Zeus." "The sea rose [during the great deluge] until Nereides became Oreiades on the hills over the woodland . . . Nereus on his travels met rock-loving Pan on a submerged hill, the rock-dweller left his sea and changed it for the hill, leaving the waterlogged pan's-pipes that floated; while he took to the watery cave where Ekho (Echo) once had sheltered." "Nereus had traced the boundaries of this Kypros (Cyprus) with the deepsea prong, and shaped it like a dolphin." "Fishermen! Searchers of the haunts of Nereus! Spread not your nets for the denizens of the deep . . . he railed at the sea, and hoary Nereus." "He [Dionysos] knew the deep bosom of the waters, ever since he fled from the murderous attack of Lykourgos (Lycurgus), and ancient Nereus had entertained him in his billowy dwelling." "[Thetis] returned to the weedy hall of her father Nereus." "[Poseidon and Apollon face off against one another to do battle when the gods took sides in the battle of Dionysos and his forces against the Indians :] The stormy trumpet of the sea brayed in the ears of Phoibos (Phoebus) [Apollon]--a broadbeard Triton boomed with his own proper conch, like a man half-finished, from the loins down a greeny fish--the Nereides shouted the battlecry--Arabian Nereus pushed up out of the sea and bellowed shaking his trident." "The fishes of many colours for her [the city of Beroe (Beruit) in Lebanon] banqueting-table, which dance on the table of Nereus in the brine." "[When Poseidon led the Sea-Gods into battle against Dionysos and his allies during the Indian War :] Ancient Nereus armed himself with a watery spear, and led his regiment of daughters [the Nereides] into the Euian struggle. With sea-traversing trident he leapt at the elephants, terrible to behold: many a neighbouring cliff along the shore toppled sideways under the seapike of Nereus. The tribes of Nereides sounded for their sire the cry of battle-triumph: unshod, half hidden in the brine, the company rushed raging to combat over the sea." "[When Poseidon led the Sea-Gods into battle against Dionysos and his allies :] Libyan Nereus caught up his conch under the water by Syrtis, and boomed on his sea-trumpet. Then one rising from the surge, and stepping on land rested his left foot on a rock, and with right broke off the top of the cliff with earthshaking tread and hurled it at a Mainas' (Maenad's) inviolate head." "[When Poseidon led the Sea-Gods into battle against Dionysos and his allies :] Nereus defending the sea came on land to fight with foaming arms against a rock-loving Pan." "[When Poseidon married the nymph Beroe, Nereus came with a wedding-gift :] Arabian Nereus brought to the bridechamber in the deep a worthy gift of love, a clever work of Hephaistos (Hephaestus), Olympian ornaments, for the bride; necklace and earrings and armlets he brought and offered, all that the Lemnian craftsman had made for the Nereides with inimitable workmanship in the waves--there in the midst of the brine he shook his fiery anvil and tongs under the water, blowing the enclosed breath of the bellows with mimic winds, and when the furnace was kindled the fire roared in the deep unquenched. Nereus then brought these gifts in great variety." 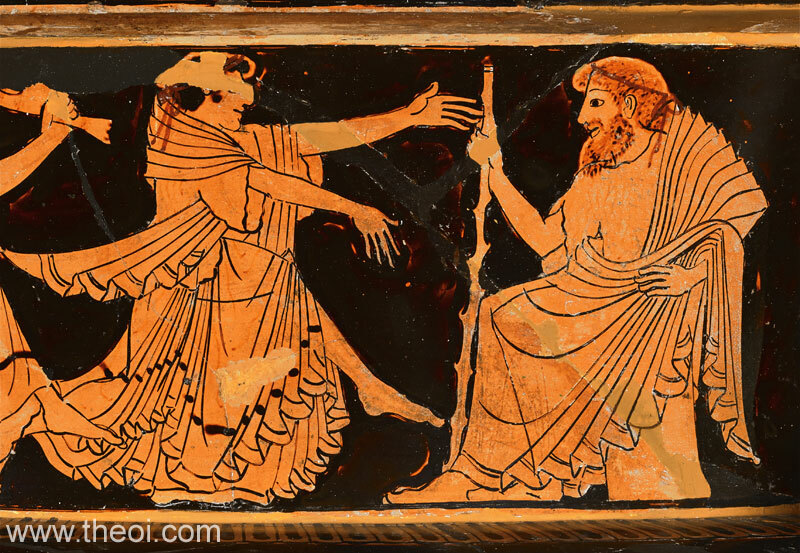 "That was a wedding [the marriage of Dionysos and Pallene] of many songs: . 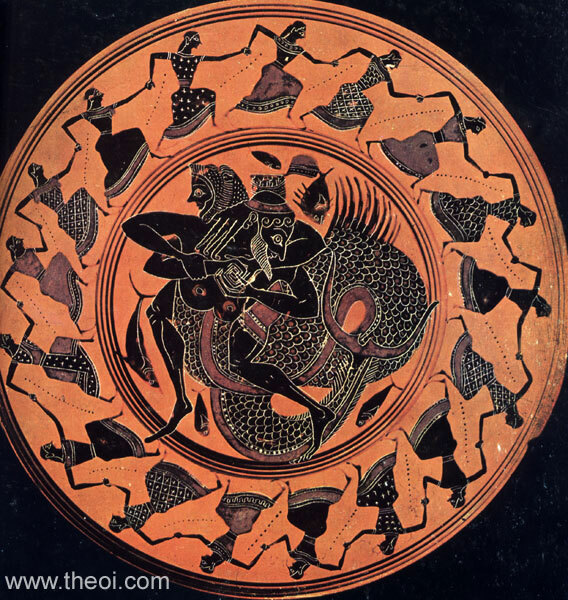 . . Companies of Nereides under the foothills of the neighbouring isthmus encircled Dionysos with wedding dances and warbled their lay; beside the Thrakian (Thracian) Sea danced old Nereus, who once had Bromios [Dionysos] for a guest."